MK Hanin Zoabi confronted by angry Jewish residents as she visits Hevron’s Arab residents. Arab MK Hanin Zoabi (Balad) was confronted by angry Jewish residents of Kiryat Arba and Hevron as she visited Hevron’s Arab residents on Sunday afternoon. She was accompanied by IDF soldiers during her visit. 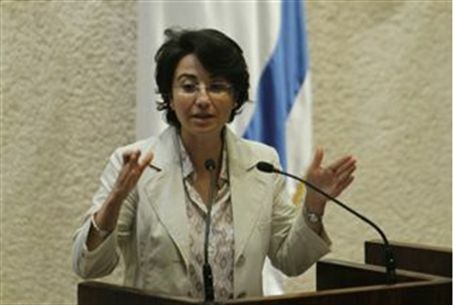 Zoabi was aboard the Mavi Marmara during the 2010 Gaza flotilla which was organized by IHH terrorists. Her fellow passengers sought to lynch Israeli naval commandos who boarded the ship in accordance with international maritime law. It is widely believed Zoabi could not have been unaware that the attempted murder of Israeli soldiers was about to occur, but took no action to stop the attack or warn the soldiers. The soldiers, who first attempted to use less-than-lethal arms to defend themselves, were eventually forced to use live fire resulting in the deaths of nine Turkish nationals. Most recently, a photo was published which shows Zoabi rubbing elbows with well-known Hamas figures. The photo, recovered with a cache of intelligence data in December, shows Zoabi alongside four known Hamas members, two of whom have served time in Israeli prisons for alleged involvement in a terror organization. One of the terrorists Zoabi was photographed with is Aziz Duwaik, who has served as the Speaker of the Palestinian Legislative Council (PLC) since January 2006, and who was recently re-arrested by Israel at a security checkpoint near Ramallah.